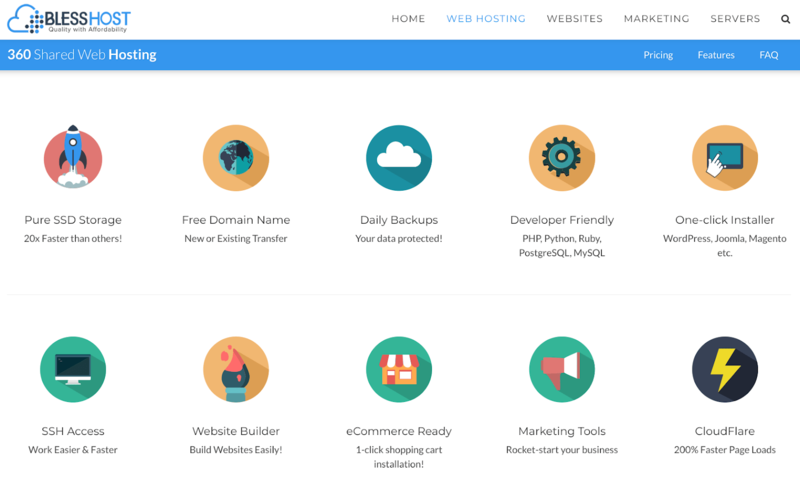 BlessHost Review 2019: Is BlessHost a Good Hosting? BlessHost is an Abu Dhabi-based hosting vendor that provides hosting services worldwide. Their hosting solutions include shared hosting, dedicated servers, VPS, reseller hosting, and managed WordPress. Established in 2014, Abu Dhabi-based BlessHost has a growing customer base also in several other countries including Germany, Malaysia, India, and Israel. They specialize in providing web hosting, cloud computing, web design, marketing, and SEO services. Their own website is in English. BlessHost’s SSD servers are hosted in data centers located in the Netherlands, Germany, Dubai, Singapore, and various U.S. cities. BlessHost has put in place stringent and resilient security measures to ensure their data centers are fully secured, both physically and in terms of 24/7 monitoring by technicians. BlessHost performs daily data backups to protect against loss of data and files, but they do not guarantee the existence, accuracy, or regularity of their backup services. You are solely responsible for making your own website backups. This hosting provider offers secure and reliable email hosting solutions for personal and business use, which includes a responsive email design, email analytics, proven deliverability, and webmail. They also offer WordPress hosting as an additional package, which comes with automatic updates, real time security scanning, and account isolation to protect your website. At first glance, BlessHost’s web hosting plans look pretty expensive. However, a closer look reveals that the plans are pretty reasonably priced for the features that are made available. Their ‘360’ web hosting plan offers unlimited SSD disk space and bandwidth, which is rare in the web hosting world. This plan also includes free website migration, free CDN, free Comodo SSL certificate, free domain name registration or transfer, and a free site builder with one-click installer. The icing on the cake is a free 30-day trial period and a 99.9% uptime guarantee. BlessHost has an outstanding customer support team that can be reached via telephone, ticket, phone, email, live chat, or Skype. This 24/7 support provides real-time solutions to customers’ hosting problems, and I have personally found the support staff to be responsive, honest and accommodating. If you like to support yourself, you will like their detailed FAQs but will be lacklustre about their somewhat sparse knowledge base that over-promises and under-delivers. BlessHost seems to have mastered the balance between quality and price. Their hosting plans are ideal for both small and big businesses, especially in the United Arab Emirates and other countries where this vendor has data centers. Check out BlessHost’s web hosting options today! Wondering how BlessHost stacks up against other Web Hosting companies? Enter any other Web Hosting company and we will give you a side-by-side comparison.